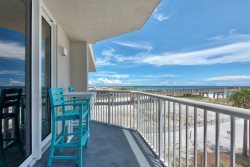 "Wave On By" is a great vacation rental for the budget conscious guest and is a comfortably furnished 2B/2B condo on the Gulf side of Navarre Beach. This 2nd floor unit offers upgraded granite counter tops in the bathrooms, a fully equipped kitchen, a dining area, a comfortable living room, a king size bed in the master, a queen bed and a twin bed in the guest bedroom, a large wall mounted Flat Screen TV and DVD player in the living room, wireless internet and a balcony with a view of the tennis courts and the beautiful swimming pool. Family vacation. Property is in a great location. It's quiet and clean. We found everyone friendly, efficient & helpful. Our stay was exactly what we wanted, quiet & relaxing. Beachview 204 was comfortable & clean.